5 Best Gun Oils [WITH PROS AND CONS]. What Are The Best Binoculars? Almost as soon as telescopes were invented, opticians of the time began experimenting with attaching two small telescopes side by side. This allowed three-dimensional viewing through two eyes, which is more natural than two-dimensional viewing with one eye closed while looking through a telescope. The advantages quickly became obvious, because anyone’s visual power that used them had now greatly increased. In fact, for hunting, which was one of the staples to put meat on the table, game could be seen at ranges that were inconceivable before, and planning could now be done to intercept or creep up on the target without scaring it away. And in those early days of firearms, hunters needed all the help they could get. However, those same attributes that made binoculars for hunting so valuable then, make them equally valuable today. And with today’s better lenses, optics and coatings, it makes them even more so. That leads us to the best binoculars that you can get for hunting. Virtually any binocular you use is better than using none at all, because you’ll be able to see further and pick out game where your regular eye couldn’t. But the best ones will have superior optics, lens coatings that enhance your view, while giving you the perfect magnification with the best field of view. There are certain categories that must be taken into consideration when choosing a pair of binoculars, what they mean and which characteristics are more or less important. 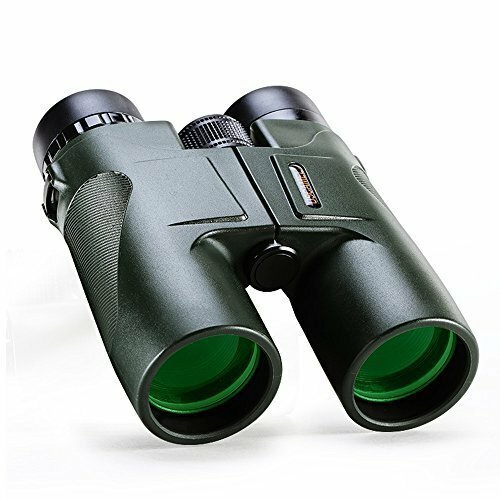 In the following sections, we will get into those so that when all that information is tallied up, you will know what makes up the basics of binoculars for hunting, and you will be able to pick out the best binocs that suit both your preference and your budget. The heart of every binocular is magnification, and without that, you may as well just be using your eyes. Granted, the more magnification you have, the closer or larger that everything will look, but, and this is a big but, too much magnification and you won’t be able to accurately see a thing. At higher power magnification, say 20X, every little shake of your hands will make the image in the binoculars look as if an earthquake is happening. At 30X, the wobble will be so great that the image will nearly be unrecognizable because it will be shaking so much. Ideally, 10X is where you want to start, which means everything looks 10 times closer than what it is. You may be able to hand-hold the binocs still enough for 15X, but after that, a tripod is the only way you’ll get crystal clear images at those higher magnifications. Keep that in mind especially if you are sighting on horseback. In every binocular, there are two measurements listed. For example, a 10 by 50 means 10 magnification power as seen through a 50mm objective, or outer lens. The objective lens is the big lens on the front where the light first enters the binoc, and the larger the objective lens size, the brighter the object will be. It is just that simple. The problem is that the larger the objective lens gets, the more unwieldy and heavy the binocular will become. Sure, a 400mm or 500mm objective lens would be great for viewing and allow crystal clear images in almost any type of lighting, but they would be incredibly awkward to swing into action quickly enough while becoming tiring to hold up for any period of time. Having a 40mm to 50mm objective size is in the ideal range for viewing down range, giving the best lighting performance for the weight and size. Simply put, a greater magnification, a smaller objective lens, or both combined, give a lesser field of view. Looking through your eyes, you get a 180 degree field of view. You are able to see the whole picture in front of you with no problem. But as soon as you begin to limit your field of view through binoculars, you’ll then need to start moving side to side in order to see everything. So, getting the largest field of view to see as much as possible without moving, is ideal. The preferred field of view here is to find a compromise between magnification and objective size. Lower magnification increases your field of view, but you’ll see less at distance. A larger objective lens also increases your field of view, but the larger they get, the heavier and more unwieldy they get too. The exit pupil is the size of the beam of light that enters each eye from the binocular lens. The brightness index is a theoretical measurement about how bright the image should be when exiting out the exit pupil. To find out the brightness, you square the exit pupil value. Now, without getting too mathematical here, a smaller magnification with a larger objective lens will give your eye a brighter image to see, and conversely, higher magnification with a smaller objective lens gives your eye a darker image to see. Now, standing on a hill and looking into a sunlit meadow with any binocular, is going to give your eye plenty of light to see just about anything, but on overcast days, getting near dusk or looking into shadows beneath brush or trees, you will need a good balance between the exit pupil lighting and relative brightness. There are two kinds of prism type binoculars. Porro prism and roof prism. Although they use prisms to direct the incoming light to an eyepiece, they do it in different ways. Porro prisms use two prisms mounted inches apart within the body of the binoculars, and bend the incoming light into a “Z” configuration to make the image upright when coming out of the eyepiece. Roof prisms are mounted inline and use a “V” configuration within the prism to turn the image upright before exiting the eyepiece. Roof prisms have always been considered more rugged than porro prisms, and because of their inline design, roof prisms have always been less bulky to handle. In modern binoculars, there is virtually no difference in image and light quality due to manufacturing and coatings that are now applied, and as a whole, with roof prisms being a bit more complex to make, they are generally more expensive than porro prism binocs. There are 3 focus types in binoculars. Individual focus, center focus and focus free or fixed focus. Each of them has their own specific uses. A zoom function is not an actual focus. It just increases the magnification, with the turn of a zoom knob, while also decreasing the brightness. A zoom works best on bright sunny days with little or no shadows. Individual Focus — Much like the name says, each small “telescope” gets focused independently of the other side. These were commonly used in the military. Center Focus — Generally a large focusing ring, in the center of the binoculars, is turned to focus both “telescopes” at the same time. Focus Free — This is a compromise focusing system that works well only for medium range distances, and will have trouble at short or very long distance to keep the image in focus. Center focus binoculars are the most common and the easiest to manually focus. They can be brought up quickly to the eyes, and with one hand, the focus can be quickly obtained by turning the center ring. The eye relief in binoculars is how far away from the eyepieces will your eyes have to be while still seeing a full field of view. In other words, longer eye relief means you don’t have to have your eyes pressed directly up to the eyepiece to see everything correctly. This feature comes in particularly handy if you wear glasses because the lenses of your glasses will not allow your eyes to get as close as bare eyes would. With a greater eye relief, you’ll be able to still see the entire field of view even though your eyes are not as close as someone who doesn’t wear glasses. It also works the same if you are wearing sunglasses and don’t want to remove them, or if you don’t want the skin around your eye to come into contact with the eyepiece. The newest advances in binoculars come with the varied types of optical coatings. And there are several available, but not all of them will be included on any given type of binocular. Anti-Reflective Coating — The most common coating available, these allow you to see where the glare from incoming light compromises the image quality. Phase Correction Coatings — Used only on roof prisms, phase shift of the image occurs because of the types of prisms used. Phase correction coatings align the shift for a clearer and sharper image. Metallic Mirror Coatings — Once made almost exclusively out of silver, now made out of aluminum because it doesn’t oxidize. The coating increases light reflection making an image brighter. Dielectric coatings are used for the same purpose and are usually applied only to roof prism types. Anti-Scratch Coating — Used to give the glass lenses protection from dust or dirt particles coming into contact with them. Image quality is dependent on two things, one of which is paramount and one of which is an enhancement. Lens quality is the single most deciding factor on image quality. You can have the best functioning binoculars on the planet, but if the lenses are sub-standard, the images might be grainy, blurry, dark, wavy or all of them combined. Any binocular made with a plastic lens can be considered a toy, as only the finest made glass lenses are suitable for hunting binoculars. The other important image quality factor are the lens coatings. Even if you have terrific lenses, a correct coating will make the image enhanced for sharper and crisper quality. 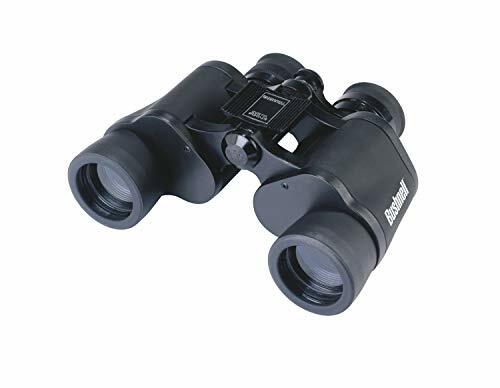 This is one of the most modern aspects of binoculars today, and all of the best ones have some type of image enhancing coating that make modern binocs the best that have ever been available. As a general rule of thumb, porro prism binoculars are more compact in size, even though they are wider and bulkier. Roof prism binocs are more streamlined but are usually longer. The larger the objective lens, the greater the weight, while the smaller the lens, the less the binoculars will weigh. That seems logical, but it must be considered if you are either walking, hiking, on horseback or sighting from a vehicle. Lighter weight binoculars will be easier to manage. If you are in a static position, like sitting or laying on the ground, you could get away with heavier binoculars and their potentially greater magnification and light gathering qualities. The other thing to consider is your own frame and muscle size. Constantly hoisting up a pair of large binoculars will tire a smaller framed, or less muscled person, out faster than someone who is bigger and bulkier. Rubber coating over the entire binocular shell provides both water repellent properties as well as damage resistance if they are dropped or banged around. However, it also adds weight, so that must be kept in mind. If you are near swamp land, near a lake or a pond and in a static position, a rubber coating may be advisable to get. Also, if you are riding 4 wheelers, horses or packing in on mules, rubber coating may also be worth considering. Rubber coating will not improve optical capability, but it might save your expensive binoculars if they are dropped or exposed to splashing water. Taking everything into consideration, here are the best reviewed binoculars for hunting, and some of them are well within any budget. #1 — Bushnell Falcon 133410 Binoculars with Case. There is a reason that these are the best selling binoculars, because they are very inexpensive yet they have quality optics in a porro prism design. Are you going to be able to drag them through the muck of a swamp or strap them to the side of a horse? No, but for virtually any type of hunting, squirrel, deer, bear, whatever, you will get some incredibly good performance out of this pair of Bushnells. The 7 x 35 design gives you a lot of light at a very manageable magnification, and the easy auto focus brings your subject into focus quickly and precisely. With a 420 foot field of view at 1000 yards, you’ll see a lot of landscape through the lens, and the 12mm eye relief is outstanding for a low cost model like this. Even at this price range the lenses are coated to enhance your viewing, and with the Bushnell name behind it, you know you are getting a quality product that has the potential to last longer than you do. Plus, 7 by 35 are considered near the optimum for power and objective, and the chances are pretty good that if your Grandfather had a pair of Bushnell’s, they were also the standard 7 by 35 model like these. For someone looking for the absolute lightest weight in a pair of hunting binoculars, you have got to check out these USCamel’s. They are made of magnesium so that they only weigh a feather light 1.3 pounds, and if you don’t think that makes a difference, try raising any other binocular up to your eyes, and holding it there, several times in an hour. These binocs are light and right. They are military spec, so you know they are rugged, and the 10 by 42 lens has a 15mm eye relief, which is plenty for anyone wearing glasses. The compact poro prism design looks almost like a roof prism inline, and they are just as easy to use in this compact and lightweight shape. With a 303 foot field of view at 1000 yards, you’ll see plenty while looking down range, and the optics are fully coated and fog proofed, so that the image will always be crisp and clear, even when the weather isn’t. You may find a better binocular at a higher price, but in this price range, USCamel rules! Multi-coated optics that are both waterproof and fogproof, these hunting binoculars are a cut above the rest. At 1.5 pounds they are lightweight yet are rugged enough to stand up to abuse that many others couldn’t. The big 16mm eye relief makes them an ideal binocular for people with glasses, and the 345 foot field of view at 1000 yards, the largest in its class, gives you a lot of ground to see. It comes with fully multi coated optics and it is rubberized for a good grip. Besides the superior optical quality you get with every one, they also come with an outstanding lifetime warranty against virtually anything, and Vortex will repair or replace them for free during the lifetime of the product. That gives these some serious mojo right there. 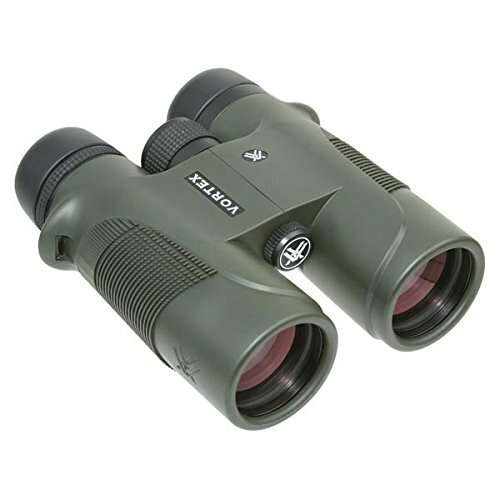 Roof prism full-size 10x42 binoculars provide 10x magnification through a 42mm objective lens. 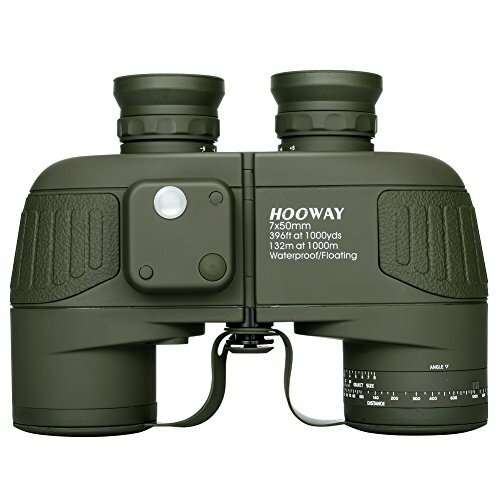 If you are a committed duck, geese or other water fowl hunter, this is the binocular to have. The Hooway floats and is waterproof, so even if dropped overboard, you’ll be able to pick it right up and begin using it again. Plus, the huge 22mm eye relief is the best you’ll find. This is a relatively heavy binocular at a little over 2 pounds, but for what you get, it can’t be beat. Of course the 7 by 50 means you’ll have a field of view of 380 feet at 1000 yards, which is one of the best in its class, while the shockproof rubber armor will protect it from just about anything. Better still, it comes with a built-in range finder, so you’ll always know how far away the birds are, or maybe more importantly, how far away land is. They are a porro prism design, the toughest binocs here, and they will work just as good on land as they will over water. Although Carson binoculars are considered the best of the best, don’t tell anyone at Vortex about that! They would go lens to lens with a Carson, and they might actually win! #5 — If you want the best hunting binoculars, then this pair of Carson 3D Series High Definition Waterproof Binoculars with ED Glass can’t be beaten. This roof prism design is multi-coated with all of the goodies, and the ED glass is a low dispersion type that gives less chromatic aberration and image quality, both at the same time. 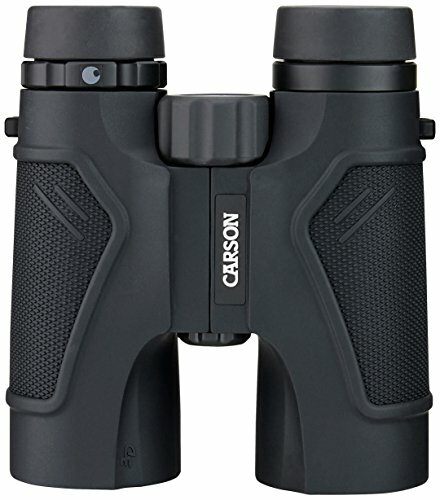 Virtually everything anyone could ever want in a hunting binocular is found in these Carson’s. From being waterproof, fog proof, and to having anti-glare and anti-abrasion coatings, these rubberized binocs are easy to grab and easy to hold on to. They come in 2 magnifications, 8 power and 10 power, and they come with 3 objective lens sizes, from 32mm to 42mm and 50mm. You can get them with any combination of power to objective lens that suits your needs. The 10 by 42 model, and the one that is representative of the line, has an excellent and long 16mm eye relief, they weigh 1.4 pounds and have a field of view of 314 feet at 1000 yards. All of those basic measurements are top of the line, and they are tripod mountable too. These are not inexpensive binoculars, and won’t be right for anybody, particularly those on a budget. But if you take your hunting seriously, these are seriously the binoculars to have. They are excellent for deer and elk. UsHuntersHQ.com is a participant in the Amazon Services LLC Associates Program, an affiliate advertising program designed to provide a means for sites to earn advertising fees by advertising and linking to amazon.com. Amazon, the Amazon logo, AmazonSupply, and the AmazonSupply logo are trademarks of Amazon.com, Inc. or its affiliates.